MINI PUZZLES (print 4 on a page) .... 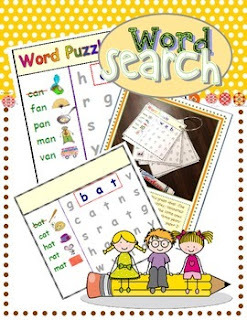 Practice letter/sound relationships while having fun with this set of puzzles teaching decodable CVC word families. A great Skills Block or Centers Activity! Step 1: Print puzzles (4 on each 8 1/2 x 11 sheet of paper). Step 2: Print drawing/labeling boxes on reverse side. Step 3: Cut on the dotted lines to make multiples of 4 identical puzzles. STEP 1: Students read each word. STEP 2: Find the matching words in the puzzle and circle them. STEP 3: Trace the words. STEP 4: Select 2 words and draw and label each on the reverse side. NOTE: This set of puzzles includes horizontal combinations ONLY. As students progress through the puzzles (additional sets are on the way!) they will begin to work with vertical combinations. Suggestions/Requests are more than welcome!